Okinawa : the last battle of World War II · One Book. One Author. One Hour. Notes on front endpapers: 17 fla[t]tops. 1853 Commodore Matthew Perry. Aug 7, 1942--Guadalcanal--Leckie lands p. 54. Ernie Pyle. Typical McArthurian selfishness. Will bombing make nations submit. Yamato-most powerful ship afloat. Ten-Go (Heavenly Operation), Bushido-bom, hara-kiri, Banyai, Kamikaze (Divine Wind), baka bombs, kikusui, Samurai, habu (snake),. Lt. Gen. Isaamu Cho, Lt. Gen. Mitsuru Ushijima. The Great Loo Choo. Admiral Chester Nimitz, Gen. Simon Bolivar Buckner, Vice Admiral Richard Kelley Turner. Underlinings/Notes: Underlinings: Lamb underscores physical descriptions of Okinawa area, relationship Okinawans to Nipponese, Japanese objectives, history, background of US/Japanese officers and casualty statistics. Notes: "Code name Iceberg," "Jesus, Allah, Confucius," "Japan air raids," "83,800 dead Japanese," "index fingers," "Belts of 1000 stitches," "fall of 45," "spring of 1946," "swords," "700 suicide boats," "June 29, 1944," "photos taken," "Franklin," "Bigger than Normandy," "7,355 miles to target," "old salt," "Leckie remembers," "shot a Jap, typewriter," "Okinawa 85 degrees," "Guadalcanal 3 years counter-offensive," "the deadly habu snake," "radio Tokyo," "6 days of shelling at Okinawa," "April 13, FDR dead," "Medal of Honor," "Grenade story," "deference," "Supply important to Okinawa campaign," "heaviest Japan artillery of war," "flame thrower," "hand to hand combat," "hospital ship Comfort," "the Japanese soldier," "Rusty Golar," "83 days of fighting," "Generations-Ushijma and Cho," "Truman letter," "only 2 bombs." 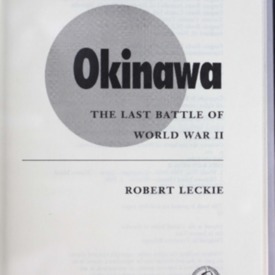 Leckie, Robert, “Okinawa : the last battle of World War II,” One Book. One Author. One Hour., accessed April 21, 2019, http://booknotes.gmu.edu/items/show/317. Describes the efforts to seize the island of Okinawa, a decisive battle for the U.S. military that led to the final victory over Japan.